South Asia is a treasure-house of musical instruments. String instruments, in particular, have an enormous diversity in structure, playing styles, performance contexts and sound as well as social and cultural functions. Despite the broad usage and cultural importance, most South Asian string instruments have a foreign origin. Many traveled to the region from Central and West Asia and were adapted into a new soundscape by incorporating local materials and aesthetics. Some instruments even traveled further into other regions such as Southeast and East Asia. This exhibition is an invitation to appreciate the diversity which is the end result of their movement across Eurasia for many centuries. The gallery is divided into three sections according to the methods of playing strings: plucked, bowed and struck. The plucked instruments have the greatest variety and are further divided into four types (sitar, sarod, vina and tambura). Each color-coded section and sub-section consists of three segments: 1) the instruments (displayed in playing position), 2) photos and audiovisual samples, and 3) a map showing dissemination. Instruments with a similar construction can be found in places quite distant from one another while instruments with identical or similar names may have substantially different shapes or playing methods. Such similarities and differences provide valuable clues to understand when and how they travel. Because instruments have always moved around with people who travel, their history is a vestige of long-term human movement and cultural interaction in Eurasia. The idea of the exhibition was conceived in 2016 when the museum acquired eight Indian musical instruments from Sandip K. Tagore, Professor Emeritus of Otemon Gakuin University who had significantly contributed to cultural exchange between India and Japan as scholar, artist, writer and musician. Professor Tagore comes from the famous Tagore family of West Bengal who were prominent patrons of North Indian classical music in its early years. A nineteenth century sitar which he inherited from his grandfather is featured in the exhibition. Earlier examples of traveling instruments from India include three instruments donated to the Japanese royal family in 1877 by S. M. Tagore, a prominent musicologist from the same lineage. 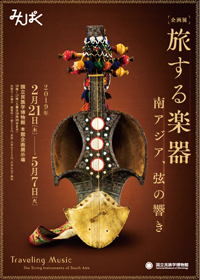 Two string instruments (kinnari vina and sarangi) are exhibited here with courtesy of the Tokyo National Museum.